There is a great quote by Frank Kingdon: “Questions are the creative acts of intelligence.” Asking the right questions makes the process of seeking answers easier because it becomes a focused journey. Educators and researchers always ask questions as they work with students, plan lessons, create theories, or design experiments. They want to know how students respond to curricula, what influences the achievement of gifted and talented students with learning disabilities, or how parents view academic programs and services. Throughout the design and implementation of The National Research Center on the Gifted and Talented (NRC/GT) research agenda, “question asking” and “question-seeking” were central to the process. We posed questions about identification, programming, professional development, special populations of students with abilities and disabilities, achievement and underachievement, classroom practices, and policies and procedures related to the education of gifted and talented children. These and other potential research topics emerged from the only federal legislation supporting gifted and talented education, Jacob K. Javits Gifted and Talented Students Education Act, priorities set by the United States Department of Education’s Institute of Education Sciences, and two NRC/GT national needs assessments that tapped into suggestions from educators, researchers, and the larger education community. As we developed research questions and designed quantitative and qualitative students, we recognized the need to ensure that instruments were reliable, valid, responsive to specific research questions, and modes of data collection. There were many excellent published instruments reviewed in Buros Mental Measurements Yearbooks (2003), Tests in Print (1999), and Tests (2003). Our experiences with using potential instruments and knowledge of technical qualities helped us with the decision-making process. Sometimes, we had many options for instruments; other times, options were limited. Therefore, we designed instruments for administrators, teachers, students, and parents that required observations, reflections, closed-ended and open-ended responses, demographic data, and work samples. All created instruments were accessible through NRC/GT research monographs that detailed all phases of research studies. We received many requests for access to and use of NRC/GT instruments and always granted permission. Instruments were used to replicate studies, conduct Master’s and dissertation theses, assess gifted and talented programs and strategies, and evaluate classroom practices. Each section includes the study’s title, abstract, and the resulting implications, guidelines, conclusions, or recommendations. Details about the development of the instruments and reliability and validity studies also are available for many studies. Descriptions of how the instruments were used and suggestions for additional uses that may be appropriate for your own settings are provided. The research study entitled Extending the Pedagogy of Gifted Education to All Students (Reis, Gentry, & Park, 1995) was designed to determine the impact of gifted education pedagogy with all students through a series of enrichment clusters. Enrichment clusters provide opportunities for students to come together to pursue advanced content through “inductive opportunities for multi-age, cross-grade student participation in open-ended investigations of student interests” (p. v). 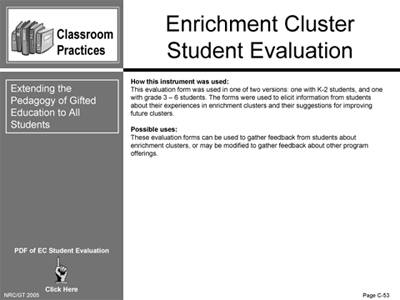 See recommendations resulting from this study and sample questions from the Enrichment Cluster Student Evaluation. The evaluation form may be used adopted or serve as a prototype for program offerings. 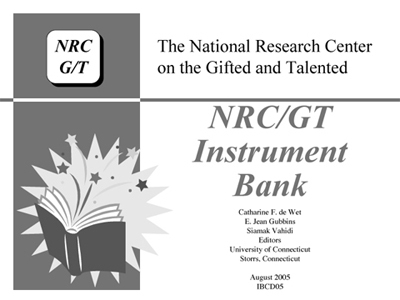 The NRC/GT Instrument Bank is a resource for your own questions about identifying and serving gifted and talented students. It also offers many prototypes for designing your own instruments responsive to local programs and services. It may be time to pose your own research and evaluation questions and the Instrument Bank will help you start the journey as you seek answers. Maddox, T. (Ed.). (2003). Tests: A comprehensive reference for assessments in psychology, education, and business (5th ed.). Austin, TX: Pro-Ed. Murphy, L. L., Impara, J. C., & Plake, B. S. (Eds.). (1999). Tests in print (Vols. I & II). Lincoln, NE: Buros Institute of Mental Measurements. Plake, B. S., Impara, J. C., & Spies, R. A. (Eds.). (2003). The fifteenth mental measurements yearbook. Lincoln, NE: Buros Institute of Mental Measurements.